The Founding... 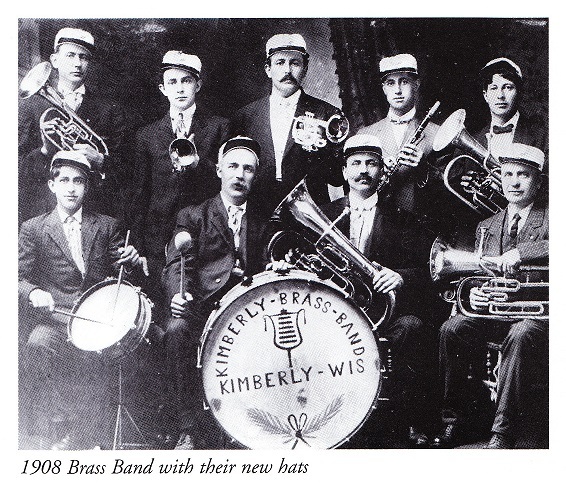 In February of 1906 the original Kimberly Brass Band was organized. It consisted of 12 founding members. 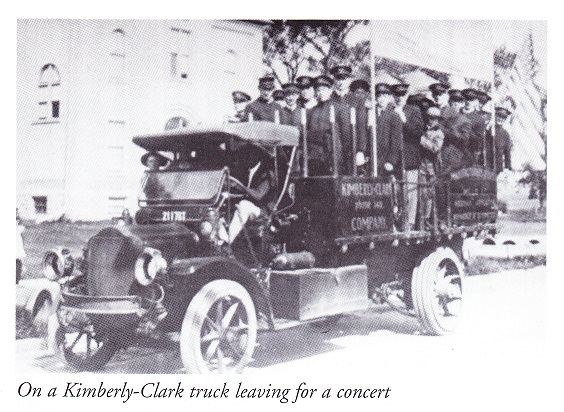 The Kimberly Brass Band's first ever public appearance was at a July 4, 1906 parade in Little Chute. It was a gala event and, although the band had no uniforms, each member was attired in their Sunday best for this debut performance. In 1908, using a contribution of 2 dollars from each band member, the band was able to appear with new caps. By 1912, with fund raising picnics and donations from local businesses, blue uniforms coats were purchased. 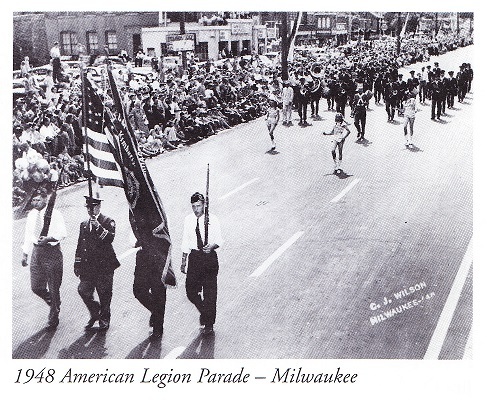 An old German custom was then initiated of making the band's first appearance each season with a parade through the Village of Kimberly on the first Sunday in May. This appearance always included a brief stop at the house of the Village President for a few musical selections. This tradition was continued until around the early 1950's. 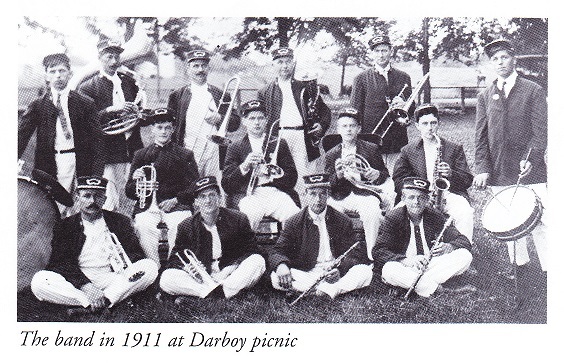 During these early years, in addition to it's traditional early May parade, the Kimberly Brass Band gave summer concerts, participated in Memorial Day and July 4th activities and played at Village picnics, parades and ball games. The band﻿ reorganizes... 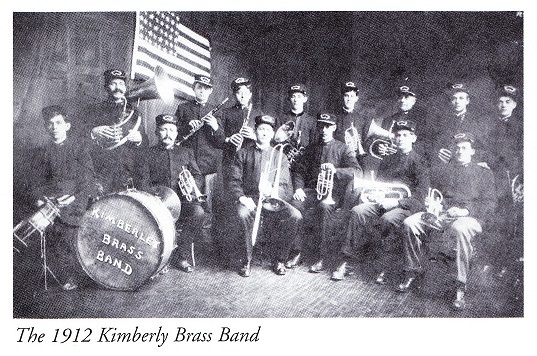 In April 1916, the Kimberly Brass Band was reorganized and under new Articles of Organization, the group became known as the Kimberly Cecilian Band, a﻿fter its patron, Saint Cecilia. IN addition, the new band acquired a complete new uniform of coats, trousers a﻿nd sailor hats. A L﻿ow P﻿oint... With the onset of the great depression i 1929, the band experienced a low period. As expected, unable to obtain any financial support during this period, the band was no longer able to retain the services of a full-time conductor. The band held informal rehearsals but made no public appearances. The Picture Brightens... In the early 1930s, a new Village Hall was erected on Kimberly Avenue. Included in the design was a band room on the upper floor. 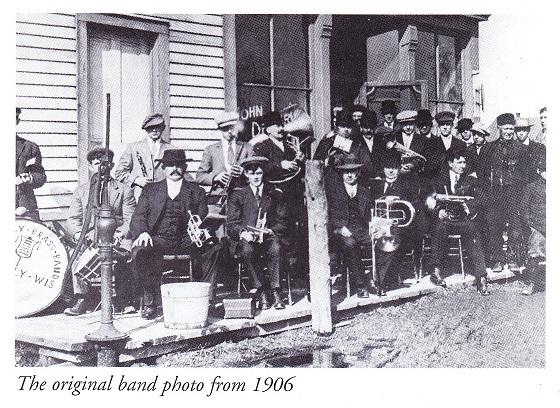 During this same period, under a referendum, the residents of Kimberly, showing much support, voted a 1/4 mill tax to help the band continue as a part of the Village and to continue with its various musical activities. At this time, a Band Commission group was organized and became effective January 1931 with Dr. C. G. Maes appointed President. 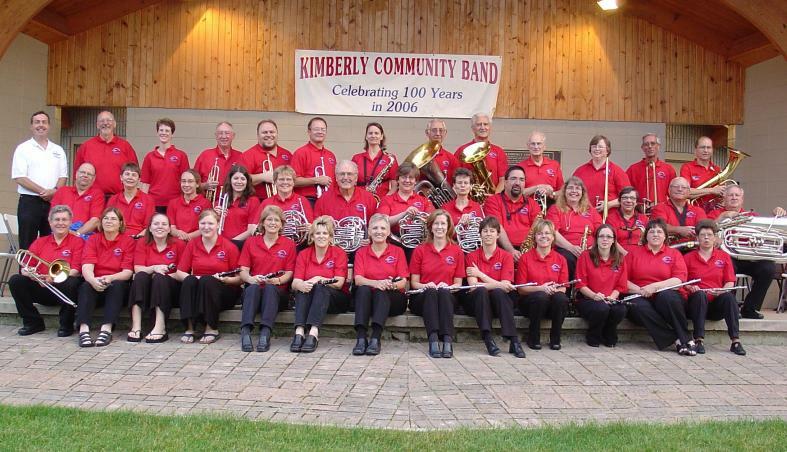 The organization was officially named the Kimberly Band Commission and the band became the Kimberly Community Band solidifying its ties with the Village. Professor Heynen then was able to return as its conductor. Professor Heynen stayed on as conductor until 1940 when he retired. At that point the band split up until 1941 when a new band organization was begun with William Maas as conductor and Frank Stuyvenberg as President. Stuyvenberg's service as President was short-lived as he was called to military service in 1942. Jess Wydeven was elected President at that point, serving the band until the mid 1950s. Mr. K... A man who deserves an immense amount of credit for his contributions to the Kimberly Community Band is, of course, Gordon Kotkosky. As a long time Kimberly High School music instructor, Mr. K was responsible for influencing and encouraging many of his students to get involved with and join the community band. Many of them are still playing in the band today. Gordon originally joined the community band in 1937 as a trumpet player. In 1957 he took over as conductor and served in this capacity for twenty years. His association with the Kimberly Community Band will be felt for a long, long time to come with fond memories. The 70s, 80s, and beyond... 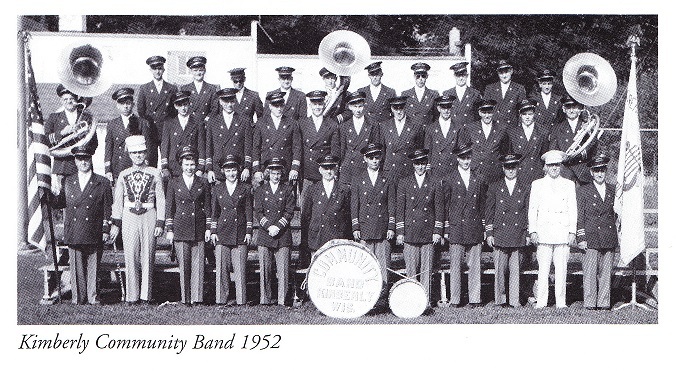 IN the late 1980s the Kimberly Community Band chose its first woman conductor... Jean Robinson. Jean served as conductor until 1999. During this period, the band continued performing at various venues as well as its regular Sunset Park summer concerts. Jean also served on the committee which worked on the developement and completion of the Sunset Park Amphitheater which opened in the mid 1990s. During this period from 1999 thru 2001, the band struggled to find a permanent conductor. The band was led by no less than 5 interim conductors, including Gordon Kotkosky while in his 80s. Band membership was also reaching a low point of around 18 players. The music however continued unabated; the numbers were low but the enthusiasm was high. 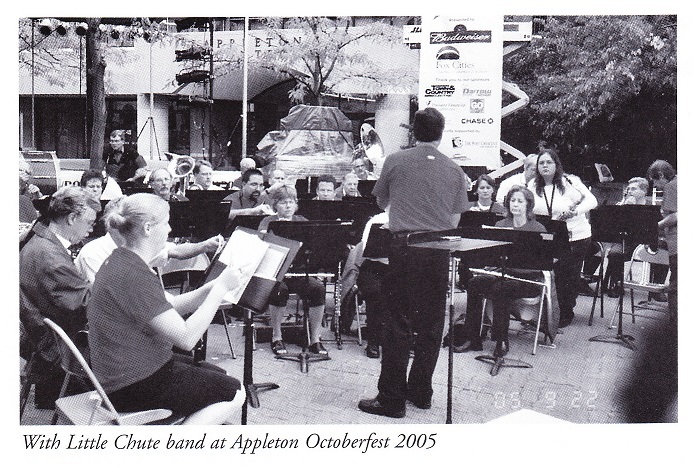 In late 2001 the band was introduced to Bob Kramer, its current conductor and leader. Bob's commitment and enthusiasm for the band and its members is apparent and much appreciated. His dedication and enthusiasm is reflected in both numbers and quality of musical performances. Band membership is also at an all time high, nearly 50 and the band's commitment to providing musical entertainment to the Village of Kimberly with its summer concerts at Sunset Park and performances the surrounding communities, we trust, will continue for ... do we dare say it?... another 100 years!